Attack of the B teams! Team announcement…. London’s original red and black army are one of the UK’s oldest leagues, full WFTDA members and continue to represent the very essence of derby spirit. LRR have been a key part of UK tournaments this year, the All Stars have just finished a challenging season in Brit Champs seeing some tough competition, and LRR’s Rising Stars led a successful campaign at Eastbourne Extreme 2015 coming in an impressive 2nd place! 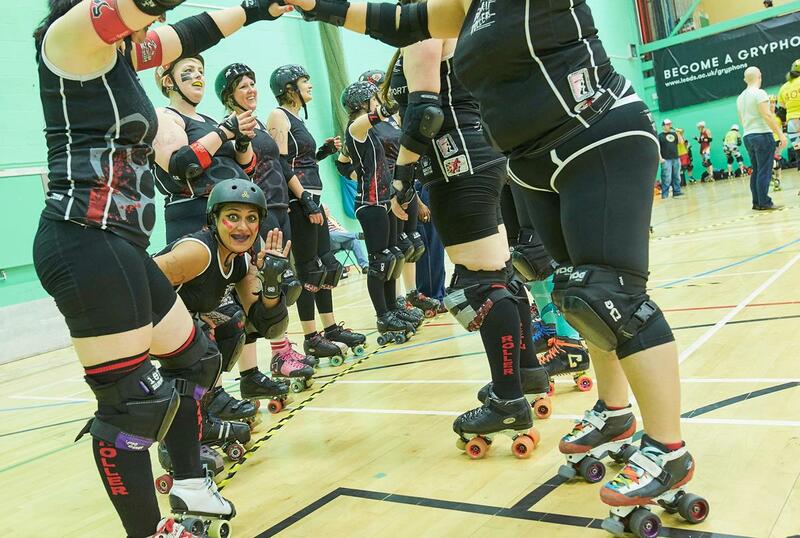 LRR’s Rising Stars are the next generation of London’s finest Rockin’ Rollers. We are excited to see what the ladies from the Capital bring to the table and wish to offer them a warm welcome into….Attack of the B Teams! DM – Badasses are the rising stars of the London Rockin’ Rollers. They are a hard working competitive team that love playing derby and take no prisoners on the track. Recently they have kicked up a storm at Eastbourne Extreme making it to the final in 2014 & 2015 (the only years they have been invited). J – London Rockin’ Rollers is just an amazing team to be in. That is all. D.D/C – Regretting not washing my pads before arriving at the venue. H-Int – In a Brash (Irn-Brute and SlappeDash) sandwich. DM – Do the thing, score the points, and let’s do it with a smile on our face. Sneak – Looking forward to a possible london derby derby. Dirty D/C – All of ’em! Bring it on! Sneak – Charizard. Because he’s a motherfudging dragon. J – Will Smith. Who wouldn’t want to see him on skates? J – Just been made a crossover so working really hard to be the best I can on both teams. Looking forward to our boot camp at the start of November with awesome coaches then our Intraleague at the start of December where I get to be a Neanderdoll!! H – Int – Party train!/making sure Miss Justice is actually on the party train. Doug Ellis Sports Centre, 150 Well Head Lane, Perry Barr Birmingham – Oct 31st-Nov 1st!